Tired of leaning forward all day to look at your computer screen or lift boxes off the ground? If so, the yoga-with-weights Camel — a classic yoga pose — is for you. It’s a simple exercise, but it has real benefits. It stretches out your spine; tones your thighs and backside; opens up your chest, armpits, and back; and improves circulation to your lungs and heart region. 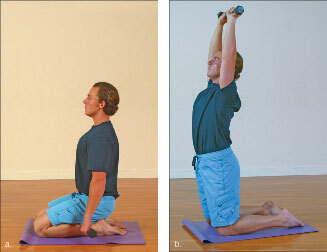 In most daily activities, you lean forward, but this exercise gives you an opportunity to stretch the other direction. If you have sensitive knees, don’t sit on your heels during this exercise. Try straddling a rolled-up yoga mat, a stack of books, or a briefcase. Sit on your knees with your buttocks resting on your heels and your legs flat on the floor, and hold the weights at your sides with your palms facing backward. This is the starting position. Look straight ahead, and keep your spine erect. As you inhale to a count of four, rise to your knees — using the power and strength of your thigh muscles — and lift the weights straight above your shoulders. Let your breath establish a rhythm as you rise and lift. As you exhale to a count of four, sit down on your legs, and lower the weights to the starting position. Don’t swing the weights. Carefully control the release as you kneel and sit back down. Do this exercise six to eight times, pause to rest, and then do it six to eight more times.